It is an exciting time for the Aerial Silks art form. It is rapidly gaining popularity and continues to explode with exciting new developments. This type of training used to be limited to Olympic level gymnasts and circus performers, but now it is being offered to the public all around the world in gymnastics, dance and fitness programs. The growth from the performance arena to the fitness industry is proving the fantastic benefits of increased strength, flexibility and muscular endurance in a low impact activity. Learn tips and techniques to make your make-up a stage worthy standout! Liquid eyeliner, fake eyelashes, brushes, red lip liner and lipstick, any other personal make up items you use and would like to bring. Clinician: Megan Gallagher, aerials and contortion performer and instructor from San Francisco. If you wish to sign up for only the aerial silks workshop, the cost is $50.00. Please CALL US to sign up for silks only. Go to REGISTER HERE and click on Workshops. Aerial Silks Adult Beginner’s Workshop – New dates to come. In this workshop you will learn the basic aerial skills and techniques. Perfect for beginners and first-timer’s. Perfect class for beginners – but FIRST timers – please enroll in the Intro Workshop before enrolling in the beginner class (see below). If you are under age 19, online (or paper) waiver must be signed by parent/guardian. Please arrive at least 5-10 minutes before class. Warm ups are very important to the health and safety of every student, so if you are 15 minutes or more late to class, you will not be able to attend class unless there is an extra instructor available to assist you in a proper warm up. This class will develop student’s strength, flexibility and fitness through an introduction to the exciting art of aerial silks. 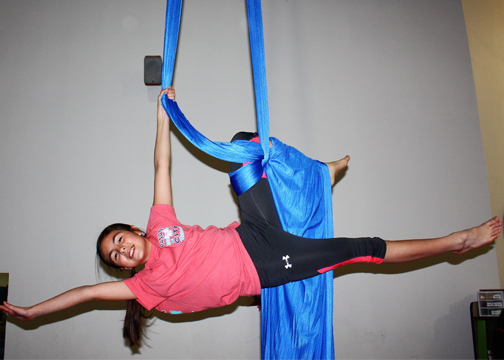 Students will learn basic skills on aerial silks, safety, strength, proper body form and vocabulary. Introductory tumbling skills are also included in the curriculum to develop spacial awareness. No acro experience necessary to join this fun class! We will work together to learn basic to intermediate acro skills. Class will include solo skills, partner skills and group activities. Ages 8 and up, (6-7 year olds may also attend classes with a parent). Parent can attend free with a paying child! This intermediate level class is by invitation of the instructor. Students will learn intermediate skills on aerial silks, safety, strength, proper body form and vocabulary. Intermediate tumbling skills are also included in the curriculum to develop spacial awareness. Aerial Silks is also known as aerial fabrics, aerial tissue, aerial ribbons and aerial curtains. It is one of the newest, most challenging, inspiring and versatile aerial art forms out there today. Artists and fitness enthusiasts (aka…aerialists) climb, twist, spin, drop and position themselves on the fabric hanging from the ceiling. When watching an advanced aerialist, the suspense builds as an they wrap complex, multi-dimensional sequences, then drop into free-falls until the last second when they catch themselves mere feet from the ground. Poses and sequences are inspired by older aerial arts forms like trapeze or rope, but new ones are constantly being discovered, including dynamic movements like drops, slides and rolls. The fabric is elegant, supple and pliable and is wrapped and unwrapped around various parts of the body. Absolutely! As in all of our programs, safety is paramount. Our silks are rigged on theatrical grade rigging and our staff is trained in safety, proper technique and progressions. Mats are used under all aerial equipment.The technology to create synthetic fabrics strong enough to hold the incredible amounts of weight of high impact drops has only been around for about 50 years. The fabric used for silks is a very strong polyester lycra or Tricot Nylon. The fabric is doubled on the rigging giving the performer two long strips of fabric to perform climbs, wraps, inversions and drops.